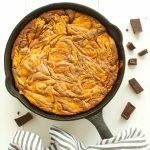 These Pumpkin Swirl Skillet Brownies are the perfect delicious fall dessert! Melt the bittersweet chocolate and the butter in a bowl in the microwave on 50 percent power (three 30-second increments should do it!) or in a heat-proof bowl over a pot of gently simmering water. Stir the melted chocolate and butter together until combined and set the mixture aside to cool slightly. Beat together the sugar, eggs and vanilla extract in a large bowl using your stand mixer or hand mixer until the mixture is smooth. Add the flour, salt and baking powder to the bowl with the egg mixture and stir just until combined. Measure out 3/4 cup of the batter you've just created into a separate bowl and set it aside. Add the chocolate mixture to the remaining batter and stir just until combined. To the 3/4 cup of batter you set aside, add the oil, cinnamon, nutmeg, and pureed pumpkin and stir to combine. Heat the cast iron skillet over medium-high heat on the stove top and melt a small knob of butter in the pan. Once the skillet is hot and the butter has melted, remove the skillet from the heat and use a pastry brush to grease the skillet bottom and sides. Dollop the chocolate brownie batter into the skillet and smooth it out as best you can with a rubber spatula. Spoon the pumpkin batter over the brownie batter and use a butter knife or a wooden skewer to swirl the two batters together to create a marble pattern on the top. Bake the brownies for about 30-35 minutes at 350 degrees Fahrenheit. When they've finished baking the centre may still seem very slightly underdone. It's a good idea to let the brownies cool just a bit (10-15 minutes) until they're set in the middle, but be sure to serve them warm (with a generous scoop of ice cream!) for the perfect ooey gooey pumpkin chocolate treat! If you're skipping the cast iron skillet, simply grease a square baking pan with butter and swirl the batter as directed above before baking for approximately 35 minutes.